In this workshop participants will be provided with information that will help them understand the relationship between nonpartisan voter registration, voting rights and election protection as a way to strengthen democracy and advance the civil rights from a local grassroots perspective that incorporates policy, advocacy and organizing. Participants will strategize how to establish and meet voter registration goals, defeat bad polices, advocate for good policies and to increase the effectiveness of grassroots education, training, fundraising and mobilization. This is a one part workshop that will be facilitated by Celeste Taylor of the Black Political Empowerment , Ron Bandes the President of VoteAllegheny, and Jamaal Craig from the United Steel Workers. 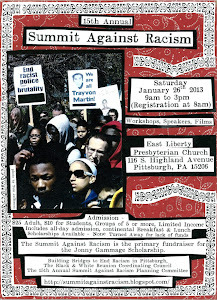 Attendees will hear from members of local struggles in the PA prison justice movement. The panel will consist of Martha Conley, speaking on the Death Penalty and Political Prisoners, Terrell Johnson, who was recently released from prison after being wrongly convicted for over 17 years, Devon Cohen will speak about Decarcerate-PA - the statewide movement opposing the constructing of new prisons and Shandre Delaney from the Campaign to Abolish Solitary Confinement. Gloria Scotts-Johnson from Parents Against Violence and the Black Radical Congress will talk about issues related to the criminalization of juveniles. This panel will by facilitated by Suzanne South. One of the main places racism and white supremacy effects our daily lives is at work. In this workshop participants will identify how white supremacy culture functions in their workplaces. Participants will strategize how to challenge this culture by collaborative brainstorming and sharing personal experiences. This is a two part workshop – 3 hours total with break In the middle. Facilitators: Mary C. Parker, Corvus Strigiform, Andrea Chiotti, Lizzie Anderson and etta cetera. Last summer, Mary facilitated a workshop for people of color at the African American Leadership Forum on racism in the workplace. The other three facilitators are involved with WWHAT'SUP!? - Whites Working and Hoping to Abolish Total Supremacy Undermining Privilege. Carl Redwood from the Hill District Consensus Group and Dan Sullivan from Saving Communities will co-facilitate this session exploring how to revitalize a community without corporate welfare and massive slum clearance, in a way that minimizes displacement of the existing residents and businesses. Presenters will focus on how direct democracy through citizen initiatives can be used as an effective, non-violent form of civil disobedience to confront the 21st century partnership of state and corporate power when that power is used to violate the civil rights of people and of nature, and when consent of the governed is no longer considered necessary by government. "Strategies for Change" is a booklet produced by the Coalition Against Violence, creating long-term solutions to deep-rooted problems. In this workshop participants will develop a reporting system that will highlight organizations that have adopted the “Strategies for Change” documents, and incorporated its suggestions into their mission and have ultimately implemented a specific program, project or initiative which will be added to the Coalition Against Violence Implementation Report for public distribution. Participants will also create a template/document which would be the foundation any organization entity or individual can utilize to begin to implement the strategies listed in the “Strategies for Change” document. This workshop is hosted by Coalition Against Violence members Valerie Dixon (Executive Director of The P.A.C.T. Initiative), Toni Lois McClendon (Communities in Action for Peace), and Tim Stevens Black Political Empowerment Project.